Gunpowder (Episode 1/3, BBC One, 21/10/2017) follows the motivation and execution of an act of terrorism. I am aware that the use of that word is both anachronistic and subject to technical objections so I will clarify by saying that it is an example of violent action by individuals against executives of the state. We could say further that it involved (potential) harm to those who, leaving aside considerations of innocence, were not the main targets of the action. In case you doubt the moral complexity of the world we have entered here please note that, in addition to its immediate resonances, the above definition also fits both the 1984 ‘Brighton Bombing’ attempt on the life of Margaret Thatcher and the 1944 ‘July Plot’ attempt on Adolf Hitler. Beyond its aftermath in 1605 – public anger and violence, increased security, London’s foremost playwright following up the next year with a very successful play about the murder of a Scottish king – the persistence of the Gunpowder Plot in the British nation memory is truly amazing. It has been a touchstone of sectarian debate and an outlet for non-specific desire for vengeance right up to the present day. In the last decade I have stood on November 5th in the picturesque East Sussex town of Lewes in front of a large effigy of the Pope atop a bonfire while a compère whips up the enthusiasm of a large crowd over the PA system: “What shall we do?” … “Burn him!” … “What shall we do?” … “Burn him!” Not hard to find uncomfortable resonances in that one. Gunpowder is aware of all this and shoulders its moral responsibility with seriousness. We follow Robert Catesby (admirably played by Kit Harrington, lately returned from the Game of Thrones, himself a descendant of Catesby and credited with involvement in the development of this project) who is presented as the instigator of the plot. Evil is personified by yet another great performance from Mark Gatiss as Robert Cecil, 1st Earl of Salisbury whose twisted posture, presumably signifying his twisted soul, would be more in place in Jacobean theatre than in our own times. But moral complexity does not come from villains and it is Catesby’s progress from Catholic aristocrat to terrorist that is the substance of the first episode. Concerned about the harsh anti-Catholic measures (which, despite promises, King James I has failed to curb) he witnesses (as do we) the public execution of two catholics arrested in his presence. The graphic details of hanging, disembowelling, dismembering and crushing to death of the two martyrs, steadfast in their refusal to renounce their faith, is not only historically accurate but necessary to the narrative. The programme proceeds through good historical atmosphere and strong performances with an intelligent plot. Along the way, a range of contemporary opinions is represented which please those of us who are irritated when the past is pictured as having one, or at most two, ideas. It ends with counterweighing horror as Catesby, during a visit to Spain, watches two protestants being almost casually burned alive. The key question for Historia readers comes when we note that significant changes have been made to history. There is no evidence that Catesby witnessed an execution nor that it persuaded him to acts of violence. Even though the depiction of death by pressing is historically accurate the character, Dorothy Dibdale (Sian Webber), who suffers this seems to be entirely made up. Are we OK with this? On this occasion I am inclined to say that I am. No deep damage is done to the historical record by these departures. On the plus side, a drama such as this can represent the world in a way which leads us to think about the origins of violence in a reflective and unpolarised way. In our age of falsity, casual opinion and prejudice that is an achievement in which writers of historical fiction everywhere can share the pride. 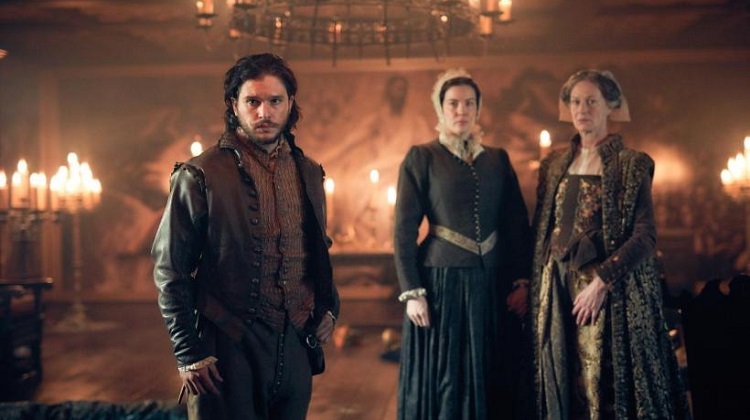 Gunpowder, written by Ronan Bennett and directed by J Blakeston, airs on BBC One from 21 October. The full series is available on BBC iplayer.